Historic Brush Farm House eventually restored! Clr Ryan celebrated the occasion by presenting Brush Farm Historical Society's equally delighted longtime president Mrs Beverly McClymont with a framed election poster featuring Brush Farm House, pictured left with Mayor Petch on Friday. Nobody was happier than Clr Terry Ryan at last Friday's official opening of Brush Farm House by Ryde Mayor Clr Ivan Petch. 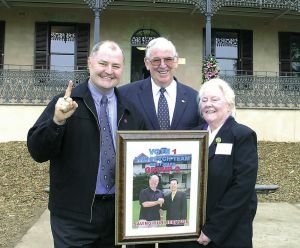 Restoration of Brush Farm House was a major plank in Clr Ryan's election policy as a West Ward candidate in the Ivan Petch Ryde Reform Group Team at the 2004 Local Government election. One of his first acts after election was to move for the immediate restoration work to commence after nearly 20 years of inaction and despite scepticism by a number of long term councillors who now join in the celebrations. Mayor Petch praised Clr Ryan on his foresight and integrity in pushing for the start of the restoration work and said he was rewarded in seeing this stage of the project brought to fruition.